LUIS includes a set of prebuilt intents from the prebuilt domains for quickly adding common intents and utterances. This is a quick and easy way to add abilities to your conversational client app without having to design the models for those abilities. On the My Apps page, select your app. This opens your app to the Build section of the app. 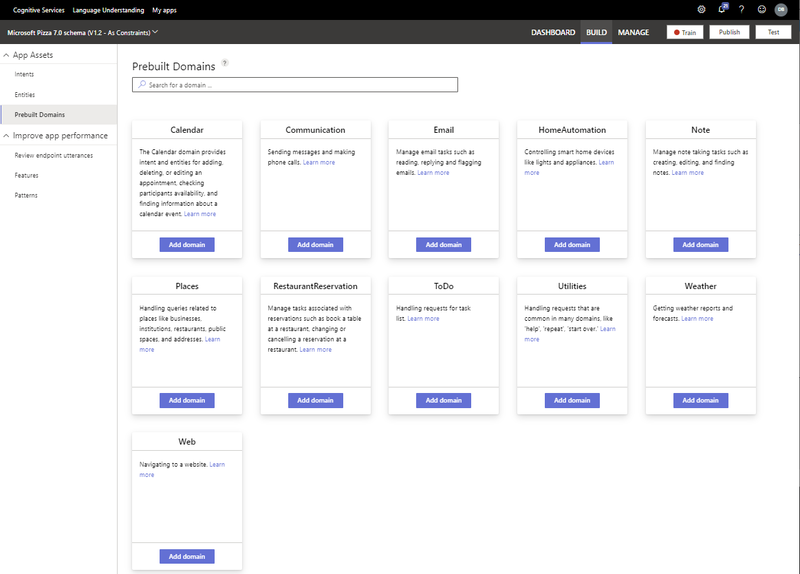 On the Intents page, select Add prebuilt domains from the bottom, left toolbar. Select the Calendar intent then select Add domain button. Select Intents in the left navigation to view the Calendar intents. Each intent from this domain is prefixed with Calendar.. Along with utterances, two entities for this domain are added to the app: Calendar.Location and Calendar.Subject. After the domain is added, train the app by selecting Train in the top, right toolbar. In the top toolbar, select Publish. Publish to Production. When the green success notification appears, select the Refer to the list of endpoints link to see the endpoints. Select an endpoint. A new browser tab opens to that endpoint. Keep the browser tab open and continue to the Test section. Test the new intent at the endpoint by added a value for the q parameter: Schedule a meeting with John Smith in Seattle next week.